The summer hit quickly at Friendly Ford, and nobody knows that better than dealership service adviser Paul Deems. A 17-year veteran of the car business with Friendly Ford, Deems said the sudden increase in temperatures led to record business at the dealership located at 660 N. Decatur Blvd. Longtime Friendly Ford service adviser Paul Deems, center, is congratulated by service director Greg Haas and assistant service manager Michelle Ochoa for being named the 2017 Employee Excellence Level 3 Achiever by Ford Motor Co. Overall, Deems has worked for more than 30 years in the car business, so he especially knows the time frame of particular peaks and valleys related to maintenance of the business. Particular maintenance needs have changed over the years, Deems explained. Deems said vehicles need to follow proper maintenance. Illustrating his talent as a service adviser is the fact that Deems recently received the 2017 Employee Excellence Level 3 Achiever award for the U.S. Southwest area that includes Nevada, Utah and Idaho. Deems has a consistent clientele that asks for him each time they visit the Friendly Ford service department. 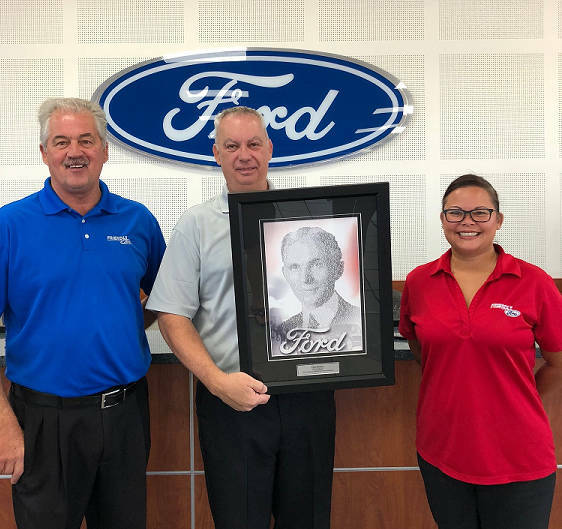 Service director Greg Haas said Deems’ knowledge of the car business is invaluable, as evidenced by the recent award presented to the longtime employee. Friendly Ford has been in business for 48 years. The dealership is an 18-time winner of the Ford President’s Award, Ford’s highest single honor for customer satisfaction. Further information can be found by calling 702-870-7221 or by visiting www.friendlyfordlv.com.